You would think that in rainy Seattle, we wouldn't give a thought to conserving water in summer. But in reality, the months of July, August and September are very dry. We do what we can to minimize water waste in our yard, but still keeping the plants healthy looking. I've listed 10 of the ways we'll be saving water on our gardens this summer. Maybe something here will spark an idea in you. Share your tips in the comments. I'm always looking for new ways to conserve. Instead of watering an entire area (and encouraging weed growth in bare patches), I use soaker hoses to water specific plants and areas. I use leader hoses (non-porous hoses) to bridge the gap between the faucet and the area to be soaked. 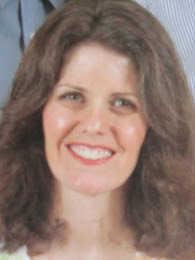 For the most part, I use free mulch -- coffee grounds (both from Starbucks and home), dried shredded leaves, grass clippings, compost, and when I see a tree company in the neighborhood, I always ask if they're trucking the clippings somewhere, and ask if they'd like to dump them in our driveway. I've gotten a lot of free branch chips this way. With trees and shrubs that are newly planted this year, I'm making donut-shaped mounds of soil to surround the trunk of the shrub/tree, keeping clear about 6 inches or so from the trunk itself. These berms prevent run-off of water, keeping it near the root zone of these new babies. Using 1 gallon milk jugs, flip the jug over. Poke 2, 3 or 4 holes into the bottom of the jug, with a nail, corkscrew or ice pick (I use a cork screw, and just screw it through the plastic). Add a few small stones to the jug to keep it from blowing away on a windy day. 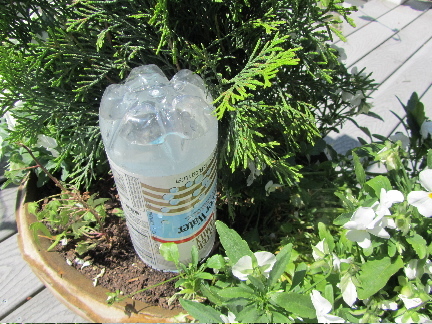 Place on soil near shrubs, fill with water, replace cap, but leave it just a tad loose, so air can come in as water seeps out. 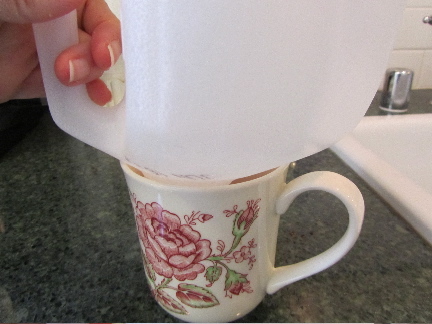 It takes about 45 minutes to an hour for the water to seep out, minimizing run-off. Refill as necessary. Great for places where you don't want an entire length of soaker hose, or are too far away from any water supply. 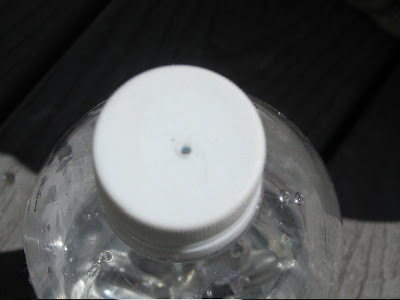 drill or poke 1 hole into the cap of the bottle. Flip the bottle over and drill 1 hole into the bottom of the bottle. 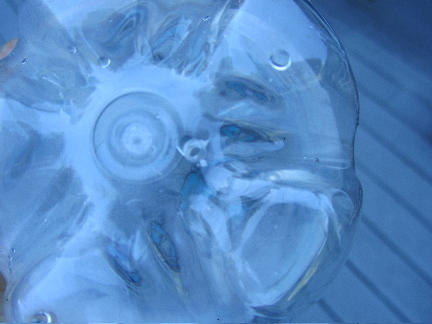 Hold 1 finger over the hole on the bottom of bottle, and fill with water, place cap back on. Turn upside down and bury slightly in your pot of plants. 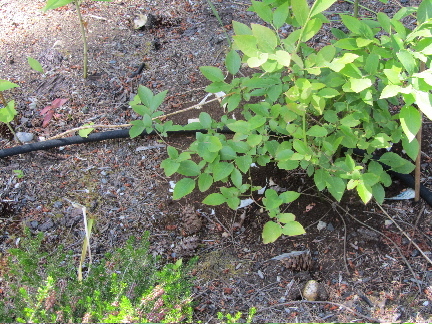 The water slowly seeps into the soil, instead of a huge rush of water that happens with a hose or can, and most of which then comes back out the base of the pot. In my pots, these take about 20-35 minutes (small vs. large bottles) to drain into the soil. These can also be used on house plants, tucked in the back of the pot, they're less noticeable and your plant will thank you for the continual sips of water. I have 2 watering cans, I keep one down by the rain barrel, the other I keep up on the deck, just outside the kitchen door. I wash lettuce and other leafy greens in a salad spinner. I dump that rinse water into the watering can on the deck, to be used to water plants up near the house. 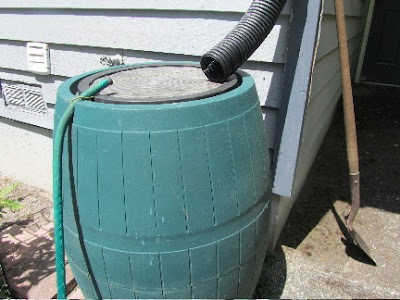 We have 2 rain barrels under downspouts from rain gutters on our house and garage. 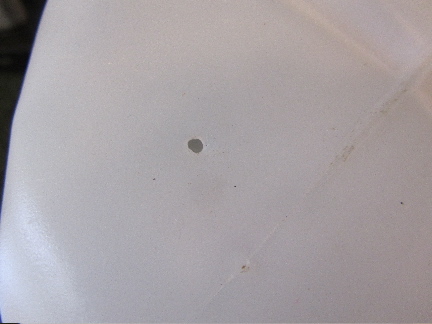 Typically, the rain water lasts until late June to early July. One good rainfall in summer will fill each can to the top, and we'll be good on water again for a week or two. We don't water the lawns in summer. The front lawn won't dry up until early August. But the back lawn will stay green all summer, due to shade. We mow less frequently in summer, and keep the mower blade set to 3 inches. Longer grass blades shade the root zone and slow any evaporation of rain or dew. It may not look as prim and tidy as a short lawn, but it will stay green longer. Also, with the front lawn, once June hits, we leave the clippings on the lawn, as a mulch. We bag the back lawn clippings, as that lawn stays green, we don't want to be tracking in grass all summer, and we can use those clippings as mulch around shrubs. We've driven over the ends of some of our hoses that were left in the driveway. 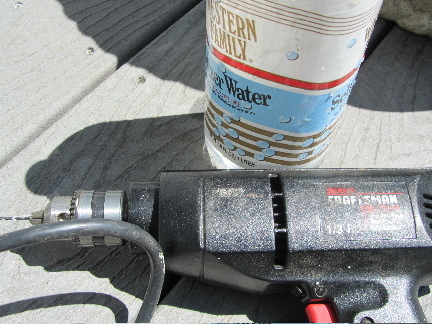 This leaves the metal screwing end of the hose slightly crimped, just enough to keep the hose from sealing to a soaker hose properly (spraying water all over a walkway or driveway). 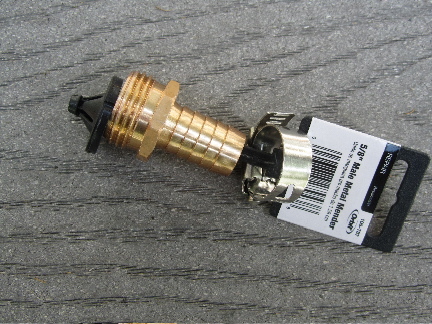 I've bought one of these inexpensive hose end repair kits and will be attempting to repair the hose myself (first time for doing this -- hope it's easy). Likewise, with hose reels which have developed leaks where the hose attaches to the reel. Ours needs a repair with some watertight glue and a crimping band. I'll be attempting to make this leak-free once more. In our dry patches (which believe it or not we do have here in the pacific northwest), sedums and other succulents are the way to go. I am slowly moving these succulents to the dry spots where I don't wish to spend my precious summer hours with a watering can. In addition, I have some water-loving plants which could really benefit from being placed out of direct, hot sun. A little plant swap is in the plans. Ten of the ways we'll be saving water this summer. I remember a time when water was so cheap and plentiful, my parents didn't give much thought to water conservation. But times have certainly changed, haven't they? Do you have any tricks for saving water in summer? That's good advice for any large delivery -- be right there to supervise the delivery! We've had truckloads of brick, gravel, sand, topsoil and compost delivered over the years. Most of the time, the drivers do a good job of placing the stuff where we want. I'd sure hate to have to quickly move 10 yards of wood chips out of the way just to get the car in and out of the garage! My other thought on wood chips--don't put them near the house. Termites are attracted to them. We have both termites and carpenter ants in the immediate area. A pebble or rock mulch is much better up near the house. Enjoy all your extra water while you can! Before we bought our house, we lived in a duplex where the landlord paid the water bill. My son had a blast with the hose as a little boy. I can only imagine what that water bill was like! I should clarify that while we have city water in our house, we have a well for outdoor watering, which is significantly cheaper than using city water! I love numbers 4 & 5! I love that I'm getting use of something for the summer, that ordinarily would have to go to the recyclers after just it's one use. The milk jugs wind up being recycled at the end of summer (we always have a stream of milk jugs coming through our house). But the 1 and 2 litre bottles I save from year to year. I checked the expiration date stamp on the seltzer water bottles (1 litres), and they're from 2003. That made me smile. I've been using these for 10 years now, and they'll last another 10, at least! These are great ideas! Do you use coffee grounds as actual mulch or compost? 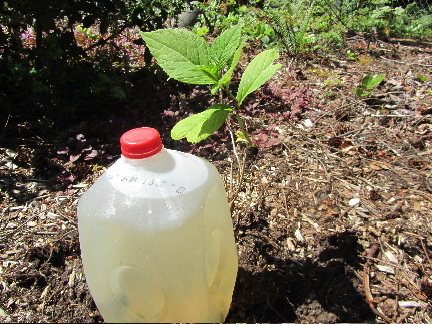 I always thought it would be acidic for mulch, but if it works, I will do it! 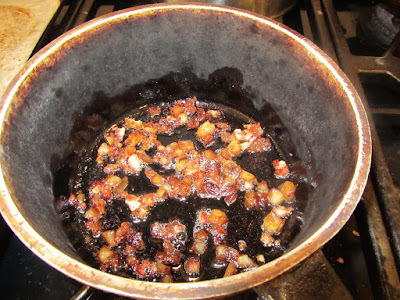 You are right, coffee grounds are acidic. I use them as mulch around my acid lovers -- rhododendrons, azaleas, camellias, heather, hydrangeas, lily of the valley, bleeding heart, dogwood, huckleberry, raspberry, strawberry, blueberries, cranberries, and at the base of an evergreen hedge. Such useful ideas for us all. Living here in North Texas and very much low on water, with water restrictions already in force-I needed some good tips. I will most certainly be trying some of these-water bottle, moving plants to a good location, repairing hoses and couplers and mulch-great post! I can imagine in Texas, summer must become quite dry. What I think of as a dry summer, likely does not even compare to what you experience! I'm glad some tips could be useful!